The Convention on the Prevention and Punishment of the Crime of Genocide (Genocide Convention) is an instrument of international law that codified for the first time the crime of genocide. The Genocide Convention was the first human rights treaty adopted by the General Assembly of the United Nations on 9 December 1948 and signified the international community’s commitment to ‘never again’ after the atrocities committed during the Second World War. Its adoption marked a crucial step towards the development of international human rights and international criminal law as we know it today. According to the Genocide Convention, genocide is a crime that can take place both in time of war as well as in time of peace. The definition of the crime of genocide, as set out in the Convention, has been widely adopted at both national and international levels, including in the 1998 Rome Statute of the International Criminal Court (ICC). Learn more about the definition of the crime of genocide. Importantly, the Convention establishes on State Parties the obligation to take measures to prevent and to punish the crime of genocide, including by enacting relevant legislation and punishing perpetrators, “whether they are constitutionally responsible rulers, public officials or private individuals” (Article IV). That obligation, in addition to the prohibition not to commit genocide, have been considered as norms of international customary law and therefore, binding on all States, whether or not they have ratified the Genocide Convention. 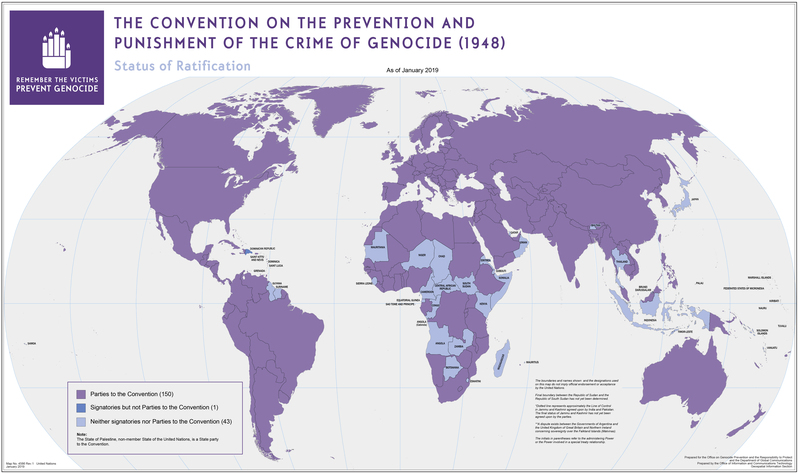 The Genocide Convention has been ratified or acceded to by 150 States (as of January 2019) . Other 44 United Nations Member States have yet to do so. From those, 20 are from Africa, 17 from Asia and 7 from America. Check the map below for details. The Special Advisor on the Prevention of Genocide calls upon all United Nations Member States that are not yet party to the Genocide Convention, to ratify or accede to it as a matter of priority, so that the Genocide Convention becomes an instrument of universal membership. Obligation to grant extradition when genocide charges are involved, in accordance with laws and treaties in force (Article VII), particularly related to protection granted by international human rights law prohibiting refoulment where there is a real risk of flagrant human rights violations in the receiving State. 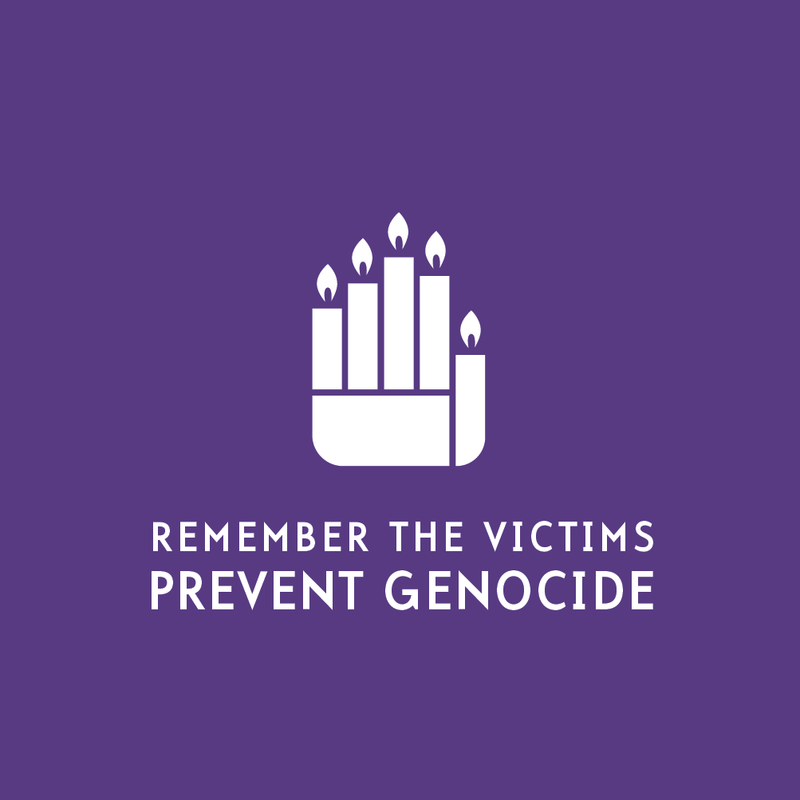 Every year on 9 December, the United Nations marks the adoption of the Genocide Convention, which is also the International Day of Commemoration and Dignity of the Victims of the Crime of Genocide and of the Prevention of this Crime. Watch the latest event marking the 70th anniversary of the Convention.